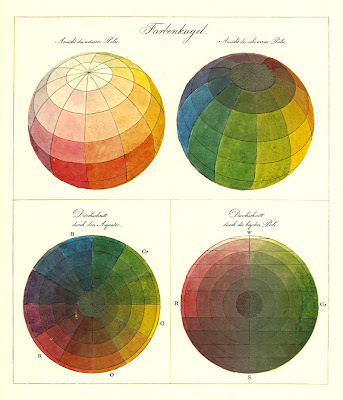 I came across this nice post about color wheels and globes in Steven La Rose's blog. 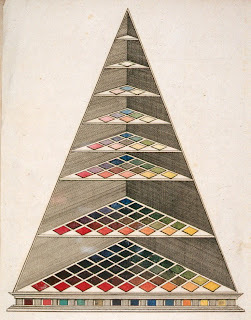 He showed a great image and provided a link to a German-language site about historical color systems which I followed, thinking I'd pull a different image for this post. Well, Steven selected the best one. And I'm not going to settle for second best, so I've pulled the same one. I love how the artist conceived the color wheel as a globe, with the true colors at the equator moving toward tints and tones at the poles. What, and you thought I wouldn't include my own work here? Roy G. Biv is a close buddy of mine, too. 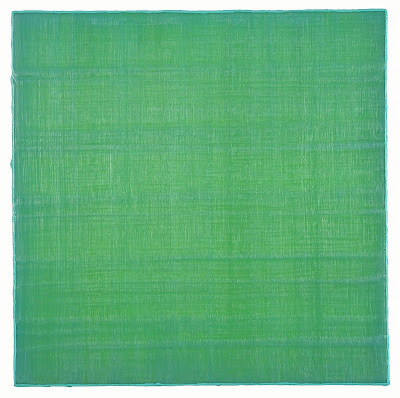 These are two new small paintings from "Silk Road," an ongoing series of small grid-based color fields. I wrote about "Silk Road" in my first post for this blog. The work has developed incrementally over time, but my thoughts about it have not. It's always about hue. .Shhhhhh is the theme for this post. 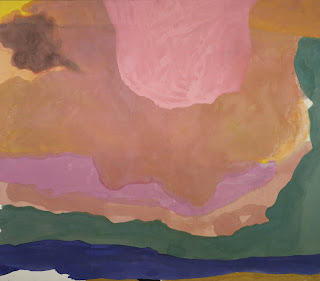 The color at Yvon Lambert is "Sotto Voce," Italian for under one's breath. The show is about monochromatic work. Yves Klein's blue is not exactly quiet and neither are some of the other works in the show, but in a strong season of dashing color worked forcefully hue against hue, monochrome--even as insistent and saturated as Klein's--comes across as understated. A palette cleanser, so to speak. 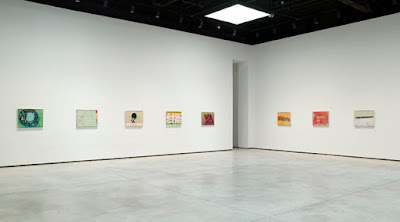 The Yvon Lambert gallery on 21st Street, now a beautifully illuminated, museum-like space, features an exhibition of works related to the idea of one color as object and presence. 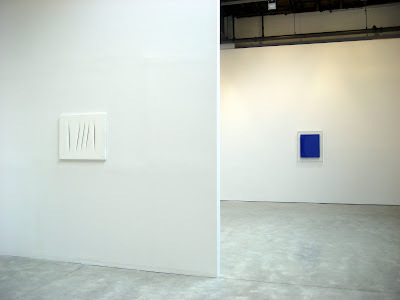 Some of the works are by artists long gone--Fontana and Klein, for instance--but other works were created in 2007 or 2008 specifically for this show. Looking around the gallery, I'd say that the works are not so much in conversation with one another but engaged in compatible monologs. 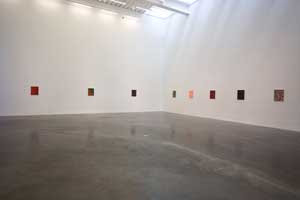 I've posted a few installation shots, but the show is up through June 7, so you have a chance to see it for yourself. I love the irony of Uecker's Quiet Voice, above right. 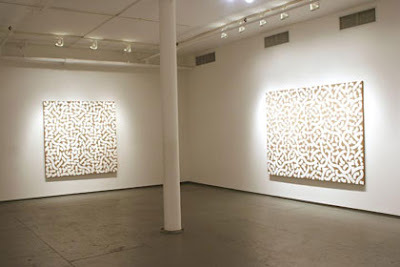 The painting consists of nails hammered into a wood substrate. Gives new meaning to "deafening silence," no? From a distance, when I believed I was seeing just dots, I thought I was seeing a work by Kusama. She's also in the show, but I don't have an image, and the gallery website's Flash system doesn't let me pull any images. 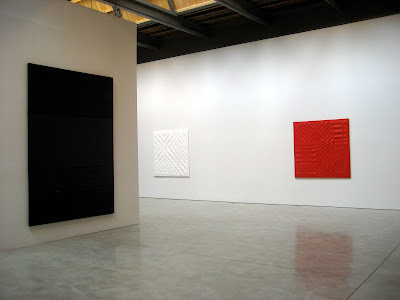 But you can see Kusama's work, plus that of the other artists in the show who are not included in this post--Brice Marden, Francois Morellet, Robert Morris and Lee Ufan--and installation shots on the gallery website. This is a show that invites sustained looking. I wish there were more benches to allow it. Continuing the monochrome theme, we move uptown to Galerie Mourlot on East 79th Street, just off Fifth, where Susan Schwalb has a small solo show, "Music of Silence: Metalpoint Paintings and Drawings," up through June 21 (had been May 31; now it's extended for almost another month). Schwalb has a similar agenda but a different effect. It is the contemplation of listening that seems to have motivated these works. And while we are contemplating Schwalb's expression of sound, there is, of course, much to see. Horizontal bands sit lightly atop a more or less monochrome surface, beneath which are revealed layers of color, some surprisingly strong. 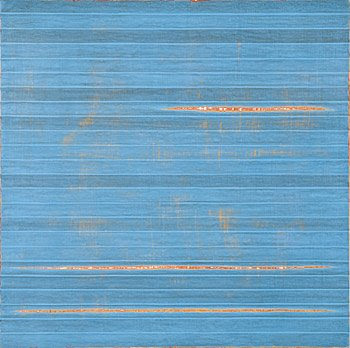 The bands suggest the cadence of music but also the strata of things, an effect heightened by the way the color is sanded to reveal the underlayers. There's a nice tension between the tranquil surface and the glimpses of what appear to be anything but. Maybe I'm reading too much into the work; formally these are beautiful compositions in which slight variations in the horizontal create pianissimo and fortissimo with the volume turned low. Schwalb works in acrylic paint and silverpoint, so as she sands away the acrylic surface, she also adds to it via the veil-like ribbons of metal she lays down--silver, copper, bronze or gold. Simply dragging a small bar of metal across the surface will deposit an ephemeral layer of the stuff. Silverpoint, used conventionally for drawing (lead, too, is a metal) here becomes something like a brush. You can see more of Schwalb's work on the Galerie Mourlot website, or on Schwalb's own website where the catalog is available as a PDF file. The two shows I'm reporting on today--Carlos Estrada Vega at Thatcher Projects, and Olaf Nicolai at Carolina Nitsch Project Room--are now over. 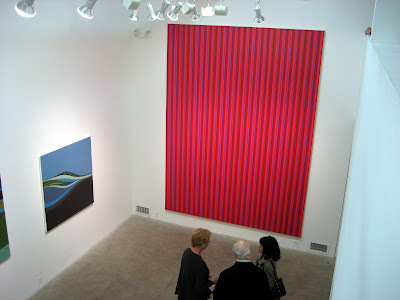 In a strong season of color, both offered some of the strongest, most saturated hues from totally different perspectives, yet each artist offered viewers the opportunity to interact with color in a tangible way--Estrada Vega through the sheer materiality of this work; Nicolai through the physical act of handling it. 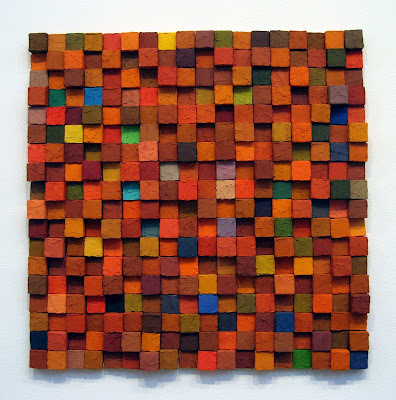 Estrada Vega, whom I've written about in the past (Playing with Blocks in the now-dormant Two Artists Talking), creates paintings that are in fact low-relief sculptures. 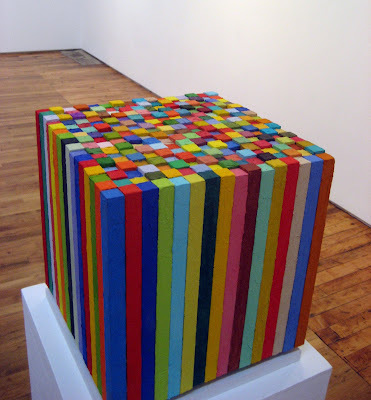 He paints tiny, canvas-covered cubes with wax paint --not encaustic, but something waxy and painty called "oleopasto"-- attaches a magnet to the bottom of the painted cube, and then affixes the magnetized cube to a metal plate. 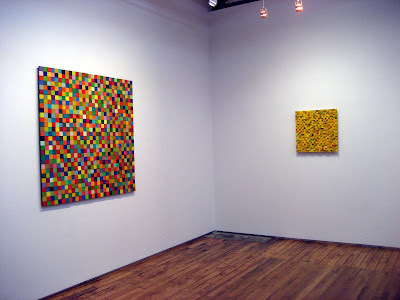 His paintings thus consist of hundreds, possibly thousands, of cubes so affixed. Presumably compositional decisions can be made during the process of affixing the cubes, so that "painting" becomes something like a game of chess. 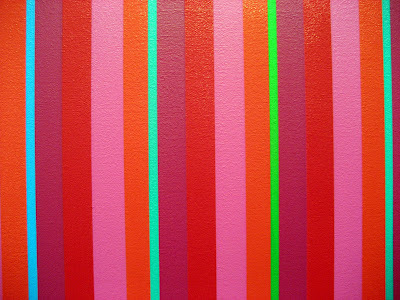 I like everything about this work: the geometry of the grid, the pulse-quickening sensuousness of the color, the intense materiality of each work, and the energy that surrounds it--not only the force that holds each compositional element to its substrate, but the almost palpable energy that remains from the process of painting and placing, painting and placing. 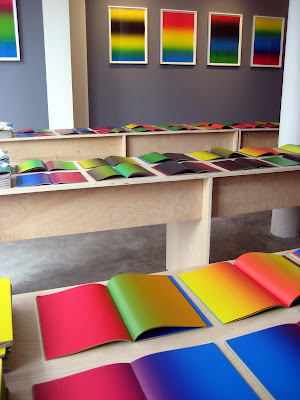 At the Carolina Nitsch Project Room, color was a tangible, touchable object: a book. 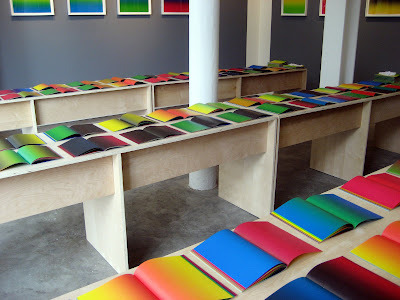 Hundreds of books, 400 to be precise, in hundreds of chromatic combinations. White cotton gloves were laid out, so you could don them and (carefully, very carefully) leaf through the pages. Because they were books, I experienced right-brain color in a kind of left-brain way. In other words, I had a whole-brain experience. Never has conceptual art been so concrete. And so sensually satisfying. Oh, the title of the show was Considering a Multiplicity of Appearances in Light of a Particular Aspect of Relevance. 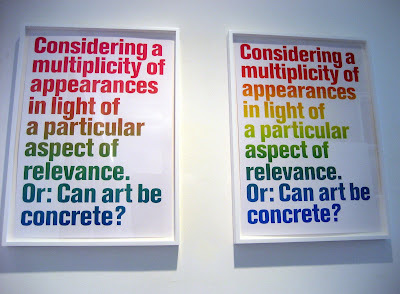 Or: Can Art Be Concrete. So it can. Nicolai, who was a name new to me, used Iris printing for the books. According to the press release, this is a process that creates a printed surface without any dot screens. That's a painterly approach to printing, isn't it? 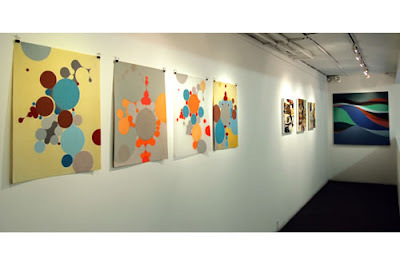 A range of visual themes, linked by the use of color, is on exhibition at this show at Metaphor Contemporary Art in Brooklyn. 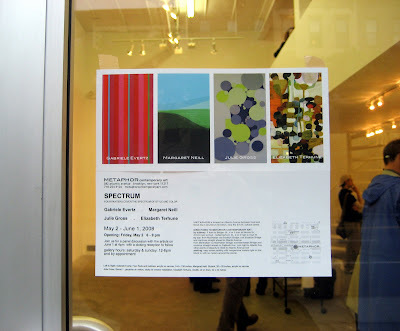 The full title of the show is Spectrum: Four Painters Cover the Spectrum of Style and Color, and the announcement card on the door shows you that range. I am, of course, partial to Gabriele Evertz and Julie Gross, whose color is carried by geometry--or is it the other way around? 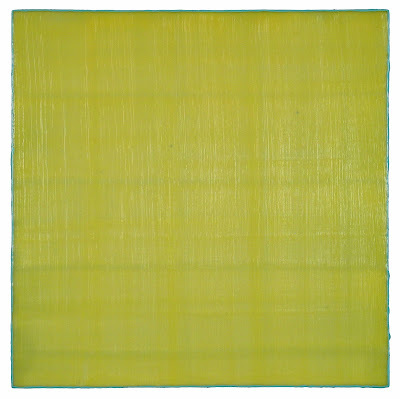 Evertz's optically charged paintings, large or small, are rigorous in their execution--technically perfect lines that set up retinal tension as the adjacent colors fight for assertion. The nearly wall-size work at the rear of the gallery was created specifically for this exhibition. Up close, the broad expanse of shimmering, vibrating color calls to you; you could fall into it, like Alice down the rabbit hole. Indeed, allowing yourself to do so--at least optically--results in a pleasant sense of spatial disorientation. 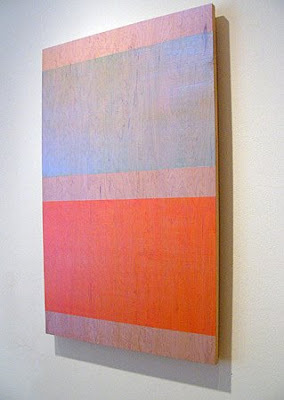 From a distance the vibrational tension is muted so that the work exists as a shimmering color field. 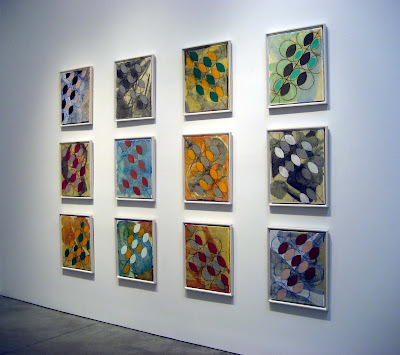 Gross's work, with its oozy bubbles and droplets, is as sensuous as Evertz's is austere. The optical agitation in these paintings makes the elements appear to be moving. Are they pushing and squeezing one another or does it just appeat that way? Gross knows her color theory; hop on to see where it takes you. Gabriele Evertz. 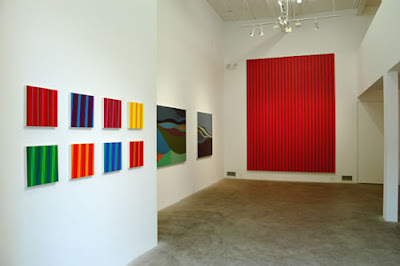 Four Reds and Ice Blues, acrylic on canvas, on the back wall; an installaton of smaller paintings in the foreground. 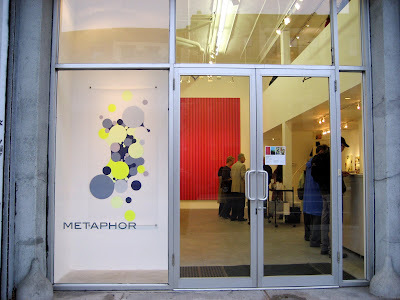 .Metaphor Contemporary Art is owned and run by two painters, Rene Lynch and Julian Jackson, whose passion for painting and painters is an almost palpable element of the gallery. 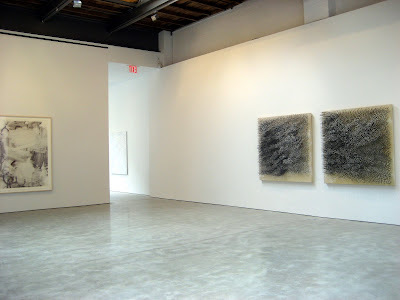 The gallery itself is a dramatic high-ceilinged white box that opens onto Atlantic Avenue. If you haven't been there yet, go. Directions are on the gallery website. It's open on Sundays. And there's going to be an artists' talk on June 1, the last day of the show..
New York is awash in color. Non-objective color. Grid-based color. Color fields. Geometric color. Sculptural color. Maybe it’s the gray economy. Maybe it’s just something in the Zeitgeist. Whatever the reason, these days it’s all about hue. Just to cover the historical end of the spectrum, there are two big museum shows: Color as Field Field: American Painting, 1950-1975 at the Smithsonian, the first full show dedicated to the color field movement (OK, so the show's not in New York, but it's full of New Yorkers); and Color Chart: Reinventing Color from 1950 to Today at MoMA. 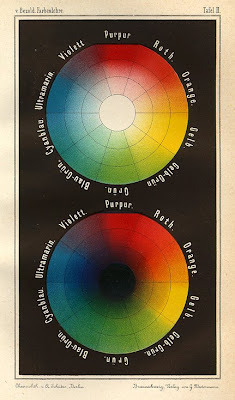 Both are examinations of color from a certain time and place, which means that with just a few exceptions they were focused on male (chauvinist) pigment. I saw Color Chart and reported on it. I have not seen Color as Field, but I bought the catalog and it's every bit as retinally stimulating as I had hoped. The show is in D.C. through the 26th and then goes to Nashville for the summer. 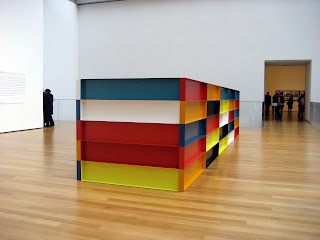 In Color Chart: Gerhard Richter, left. 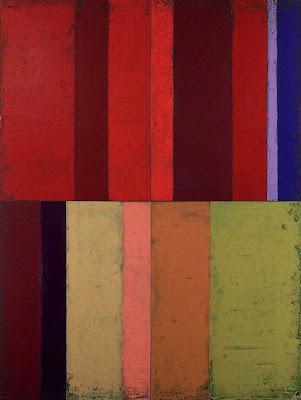 Ten Large Color Panels, 1966–71/72, lacquer on white primed canvas; 10 panels, each 98 7/16 x 37 3/8 inches. Fortunately the gender spectrum is broader once you get outside the museum walls. 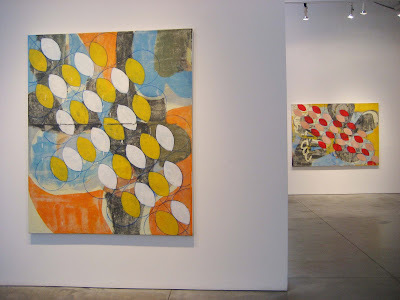 A recent post (Painting: Linearity, Angularity, Materiality, Color) and series ( On the Geometric Trail ), both on this blog, cover a broad swath of color this year. And there's a ton of it in Chelsea right now. 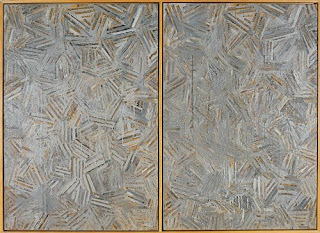 As for the achromatic spectrum, Jasper Johns had Gray at the Met; Christopher K. Ho went gray at Winkleman Gallery; Valerie Jaudon had geometrically patterned white at Von Lintel Gallery. But enough looking back. I'm going to post sequentially--with this post as the first one, to retain the narrative. Meanwhile, since you're on line you might do a little color surfing. 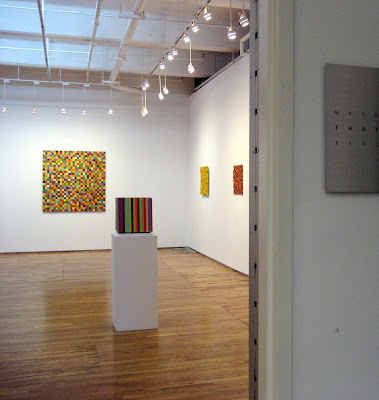 Stop in at Minus Space, a site maintained by Matthew Deleget and Rossana Martinez, where you’ll find reductive color in astonishing variety; Geoform, a cyber collection of geometric abstraction, curated by Julie Karabenick; and Color Chunks, John Tallman's utterly quirky view of slab, blocks, chunks and pieces of color, plus his own related work. I have always loved this little statue of Isis/Aphrodite at the Met. 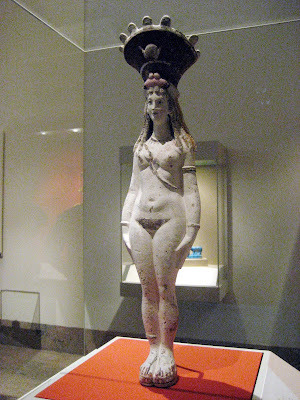 Placed in a vitrine just inside the entrance to the Egyptian wing, she stands naked, arms at her sides, with an elaborate headdress whose implied weight seems to make her posture slump ever so. She was made to represent the fertility of womanhood, and she has done so in full view of strangers over the millennia. She was created about 150 A.D., yet her body, slightly round of belly and full of hip, is one that any contemporary woman can relate to and many would aspire to. "Isis-Aphrodite is a form of the great goddess Isis that emphasizes the fertility aspects associated with aphrodite. She was concerned with marriage and childbirth . . . Popular already in the third or fourth century B.C., they continued to be made in Roman times. 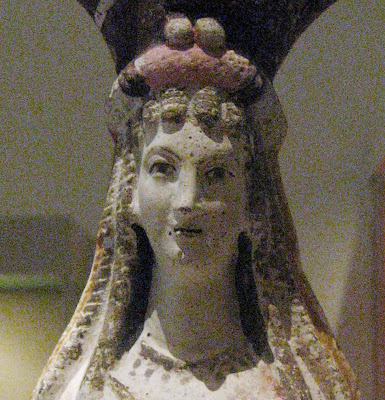 Dating technology places this piece in the Roman Period, probably about A.D. 150, and the long narrow face and rather dry expression do not contradict such a date." I can only thank the heavens that Winged Nike, goddess of victory, in the Louvre is headless. Right now (and in the immediately recent past) there’s a lot of geometry in New York, along with a lot of color. 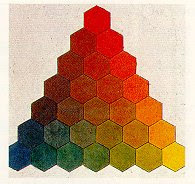 As is often the case, geometry and color go hand in hand. 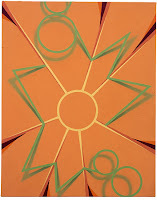 And in the work of Thomas Nozkowski, Tomma Abts and Roberto Juarez, this is decidedly true. 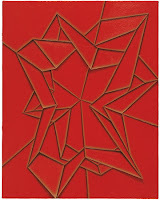 I’ve chosen to report on these three artists as a group, because it is the constancy of elements in their work, as well as the range of expression within their self-imposed parameters, that bring greater depth to their painting, and certainly more profound pleasure in our perception of it. Thomas Nozkowski, whose show at Pace Wildenstein came down last week, maintains the standard here. His easel-size paintings are not only constant in size, 22 x 28 inches, but in horizontal orientation (the works on paper are 22 x 30 inches). But what worlds within those parameters! Loose-limbed geometry is precisely realized in oil that’s as lightly handled as watercolor. The hues soar in chromatic brilliance, though Nozkowski frequently tethers them with dunned-down greens and ochers; it’s a wise strategy, for the hues tug, tug, tug to pull free, and the tension is sublime. 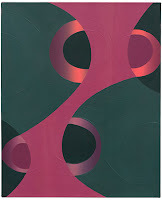 Nozkowski is prolific; the 40 works in this show are from the past three years, including several from this year. Am I wrong in thinking that after so many years of painting, he’s reached a place where the work just flows? Not that the compositions are not invested with formal decisions, but the brushwork seems confident and unlabored. Everything about this work radiates with a kind of visceral and joyous energy. The regularity of the installation suggests a narrative—readable from left or right—and each of the pictures suggests a story in a language you respond to but don’t quite understand. The formal, grid-referenced language is simple enough, but the inventiveness of circle, square, zig and zag, and the ways those shapes are endlessly permutated and placed in ambiguous space or against a patterned ground, is staggering. The visual pleasure is almost overwhelming. God, I love them! 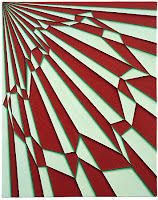 Tomma Abts, whose show at the New Museum is up through June 29, works within some of the same parameters of size and orientation (hers are a uniform 18 7/8 x 15 inches) to very different effect. 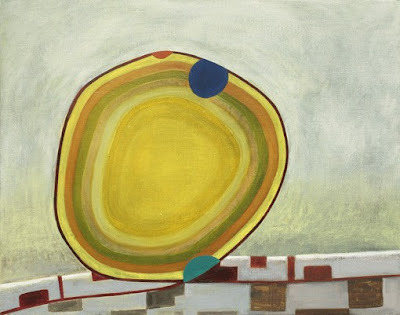 Actually, the two shows seem tailor made for comparison—a kind of geometric He Said/She Said— for while Nozkowski’s work leans toward the organic, Abts is rigorously hard edged; while his colors are exuberant and kind of quirky, hers are often grayed and somber; and while his brushwork is loose and seemingly effortless, hers is dense, opaque, and almost obsessively ascetic. He’s prolific; she’s not. .
Tomma Abts installation in the skylit fourth-floor at The New Museum. 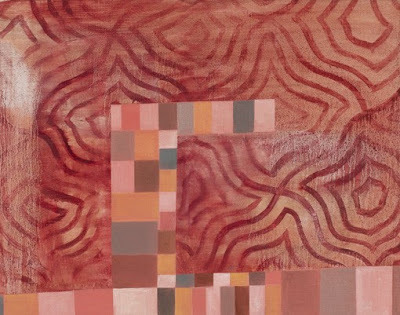 The crystalline rigorousness of Abts’s painting is odd --the shapes and compositions seem completely anachronistic to any particular time, place or ism--but they're appealing nonetheless. In part it's the mystery of them; you can’t help but wonder what led to the painting you see before you, because close-up inspection reveals the textural pentimenti of what seem to be many paintings under the surface. 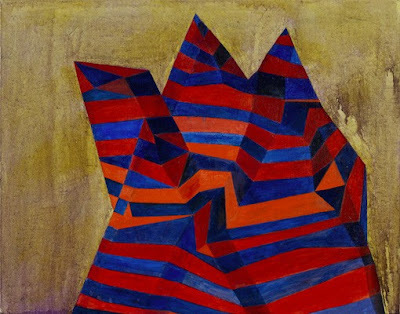 In the exhibition brochure, Abts describes her process this way: "I work on each [painting] over a long period of time; there are many layers of establishing something, then many layers of getting to know what I have established and trying different options. The final painting is a concentrate of the many paintings underneath." 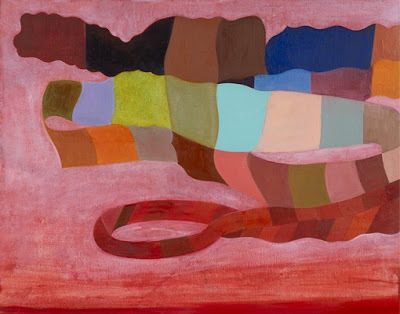 The slight shadows she paints into her pictures just increase the ambiguity of what’s on or under the surface. To revisit the narrative analogy for a moment, if Nozkowski’s installation reads like a volume of fabulous stories—A Thousand and One Nights, for instance— Abts’s installation suggests to me the Stations of the Cross. Well, that's a bit dramatic. I haven't been religious in that way since I was a child, but I remember vividly the exquisite mystery and somber ecstasy they evoked. That's what I mean to convey. 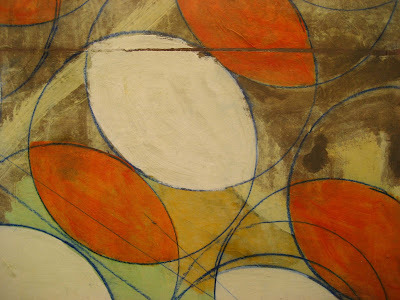 Roberto Juarez is working within a totally different set of parameters—not of size or perimeter shape but of the ovoid shape within the composition of each painting, the vesica piscis. Latin for "fish bladder," this shape is formed by the overlap of two circles of equal size. The vesica piscis is sacred geometry, an ovoid shape suggesting the fish as symbol for Christ, the birth passage, even the waxing and waning of the moon. 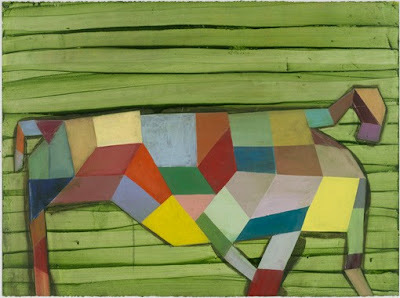 In Juarez’s work it seems to be a purely formal compositional element. The "fish" swim this way or that, a lyrical geometry of movement as well as layered color. 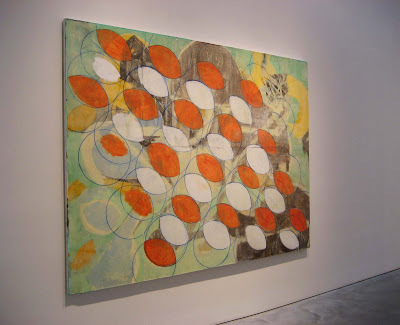 The layering has a physical manifestation as well, for Juarez paints on canvas and draws on a layer of rice paper that is then affixed to the canvas, and the two layers are further worked together. 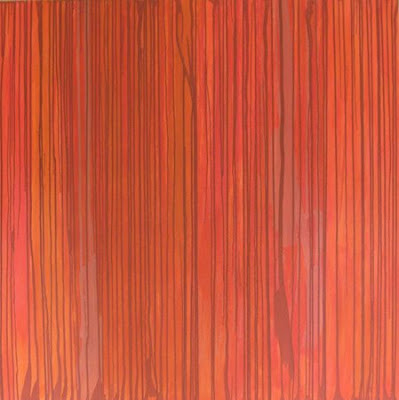 What initially appear as pentimenti are in fact essential and intentional elements of the composition. The elements seem to float—a sensation not unlike what I experienced while looking at the work. The show is at the Charles Cowles Gallery through May 17. As a coda to this post, I’d like to acknowledge the generosity and understanding of the Charles Cowles Gallery for letting me and other artists photograph in its space. This gallery and many, many others understand how important it is for artists, bloggers (and teachers and other art professionals) to have direct access to an artist’s work. Conversely, I’d like to note the difficulty of obtaining images at Pace Wildenstein and the New Museum, both of which have no-photo rules. Pace at least has posted an excellent selection of images on its blogsite, but the New Museum requires that its PR department be contacted ahead of time to arrange to shoot the works, or to acquire images for publication. For a working artist such as myself, this is simply not possible. (It is huge challenge to maintain a painting practice, see art regularly and blog about it. To have to add secretarial duties to this schedule is simply impossible.) As a result, I pulled images from the Internet. If what the New museum wanted was to control image quality, their no-photo policy is self defeating; I would have gotten images of far better quality had I been allowed to shoot them myself with an eight-megapixel camera, rather than pulling relatively lo-res images off the Internet. If their no-photo policy was simply to control the flow of images, well that’s just not possible, for as you see, I have posted pictures.